To see the individual photos and related maps, follow this link or you can view the series as a slide show. The weekly series is archived at Seeing Buffalo. The Buffalo Urban Renewal Agency (BURA) owns 509 Michigan (google map). It's right next door to the Michigan Street Baptist Church and the Nash House is behind it. 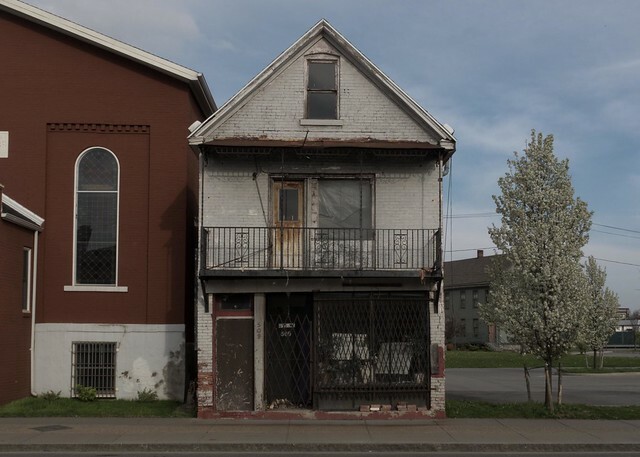 509 Michigan is located in the middle of Buffalo's African American Heritage Corridor. 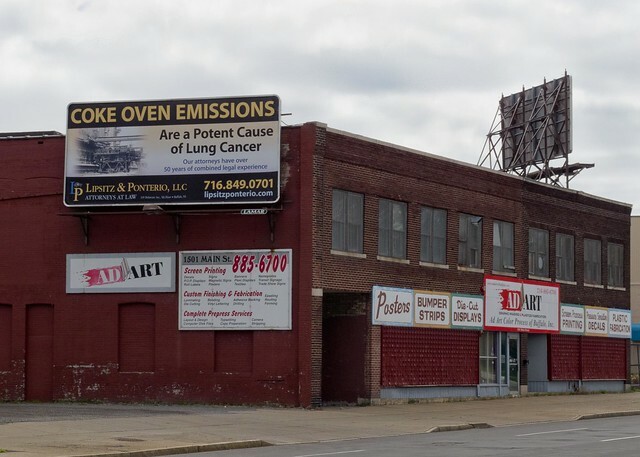 According to City records this mixed-use building, with a second floor apartment, is assessed for $20,000. It was purchased by BURA in 2005 for $350,000 from a private owner. Since the opening of the Nash House in 2007, the completion of street improvements in the Heritage Corridor on Michigan Avenue and the more recent completion of renovations at the Michigan Street Baptist Church I thought 509 Michigan was next in line for renovations. I spotted this sun faded poster in the front window the other day. I first photographed 509 Michigan in 2006 and have seen the deteriorating conditions of the building for the last six years. This is a building that must be saved. The City's Real Estate Division does not list the building for sale. There are no known plans for the building and under BURA's ownership the fate of the building remains unknown. Buffalo's Complete Streets Summit begins tomorrow evening. The two day event includes a public forum on Thursday evening and a series of policy maker forums on Friday. Howard Zemsky Co-Chair WNY Regional Development Council will deliver the keynote address. Here's that schedule. The public is invited to attend Thursday evening's forum. It will highlight the importance of implementing our local Complete Streets policies, and draw upon examples of national best practices through a panel of experts. The public forum will be held at Asbury Hall, 314 Delaware Avenue, and will begin at 5:30pm. On June 1, 2008, Buffalo's Complete Streets ordinance was unanimously passed by the City Council and signed into law by the Mayor. Defined as streets with facilities that are designed and operated to enable safe access for all users along our roadways, Complete Streets include persons with disabilities, pedestrians, bicyclists, motorists, and transit riders. Buffalo is embracing a vision to promote health, safety, community, environmental sustainability, and quality of life for all, in every season. Please check Buffalo Complete Streets for additional information. 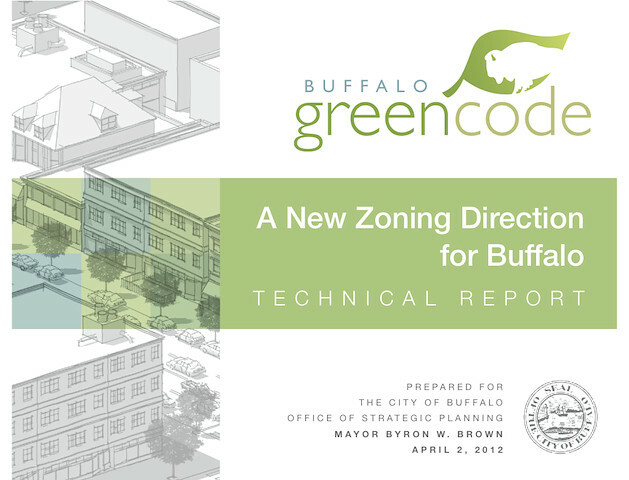 The Mayor's Office of Strategic Planning released A New Zoning Direction for Buffalo: Technical Report (download PDF here) late yesterday. 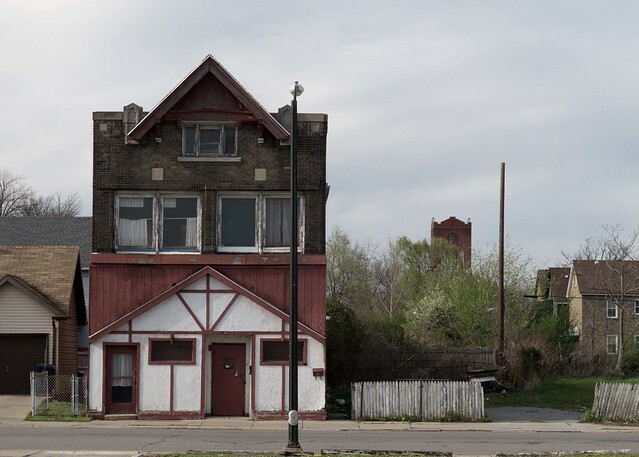 The report outlines the City's proposed approach to overhauling its zoning ordinance, a use-based or "Euclidean" code that dates to 1953. A new Unified Development Ordinance (UDO) will replace the existing zoning and subdivision ordinances and all 46 urban renewal plans in their entirety. This second phase of the Buffalo Green Code will be form-based, with a strong emphasis on traditional urbanism and walkable, mixed-use development. 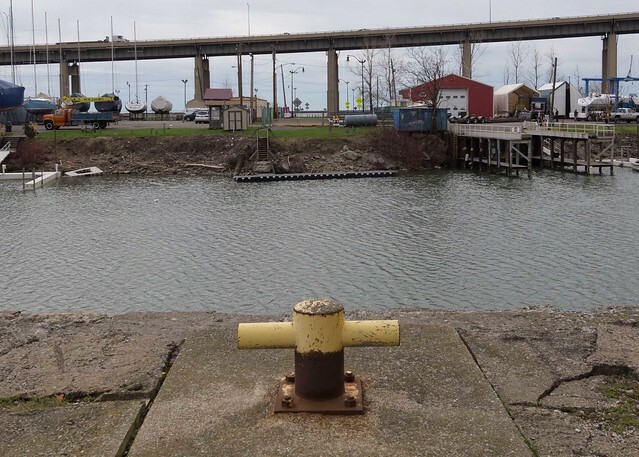 Buffalonians, especially on the East Side, will be encouraged to know the UDO will remove regulatory barriers to the reuse of vacant land and structures. Read the report. Show up at the public forum on Tuesday, April 10, 6:15 pm, at ECC City Campus. This project will revolutionize Buffalo, so be there or be square. Download the 4-page policy brief here and the Technical Report here. See you Tuesday. See: April 2010 Earth Day Public Announcement, pics and podcast. 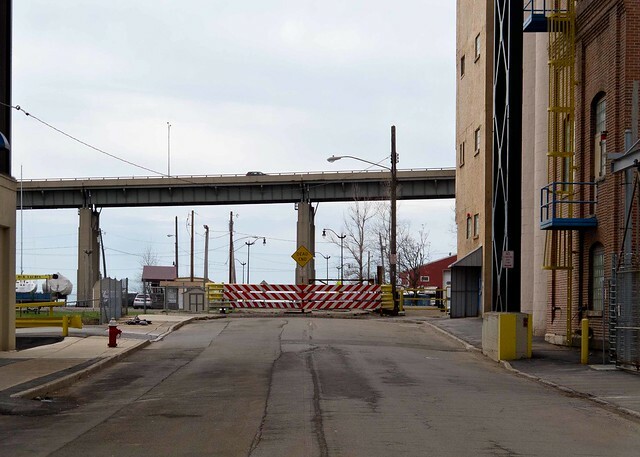 General Mills, the global food giant and maker of Cheerios, has filed an application with the City of Buffalo to buy the dead end portion of Michigan Avenue between Ganson Street and the Ship Canal. This map, part of that application shows what one of world's largest food companies wants. 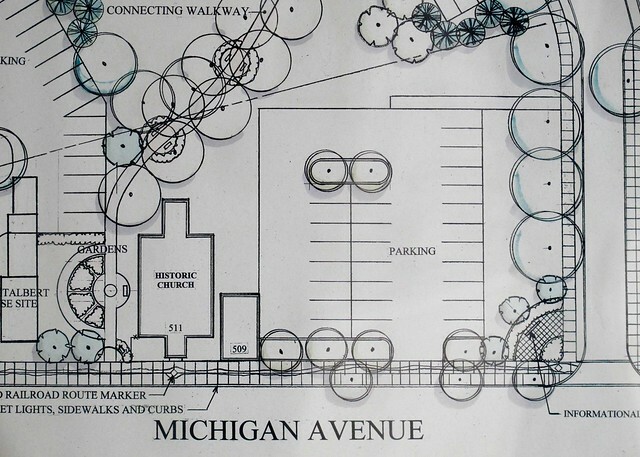 Here's the street shot showing the portion of Michigan Avenue General Mills wants to buy. The sale of this City street should not go forward. In every neighborhood City residents are fully engaged in reversing 50 years of bad urban planning. Waterfront access is part of citizen engagement in the process of reclaiming the City from past planning abuses. As seen in the last photo this portion of Michigan Avenue once connected Kelly Island to Fuhrmann Boulevard. The City removed the South Michigan Street Bridge in 1964. The recent sale of City streets on the City's East Side to large corporations has plenty of precedent. Trico bought Burton Alley between Main Street and Ellicott. Trico moved to Mexico two years later. Kaleida bought this portion of Goodrich Street between Ellicott and Michigan Avenue. Below is the site of the former Michigan Avenue Bridge. The application that General Mills submitted is before the City Planning Board and is on the agenda for their April 10th meeting. This part of Michigan Avenue at Ganson Street is in South District. Currently South District is without representation on the City Council as former Council Member Micky Kerns has moved on to the New York State Assembly. Please voice your concern and help stop this application from moving forward. Connect with Council President Richard Fontana and Mayor Byron Brown today. This application must be rejected. 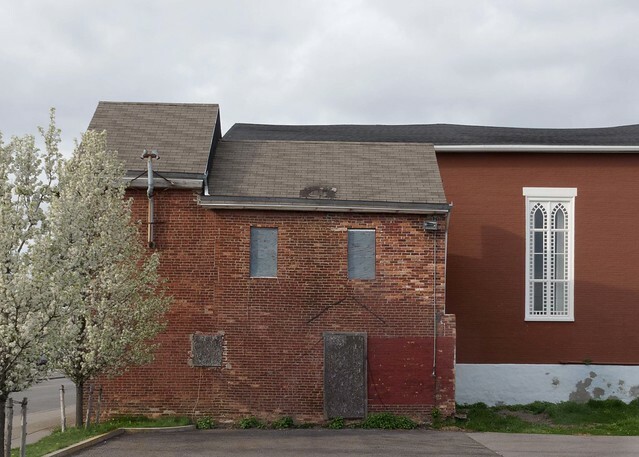 The former First United Brethren Church at 285 Masten Avenue (google map) is now for sale. Guerney Becker & Bourne has the listing. Designed in 1924 by noted Buffalo architect Frank A. Spangenberg, this English Gothic Revival style church remains in good condition. The church is located in the middle of a neighborhood that's experiencing a burst of new interest and investment. A number of urban homesteaders have settled the surrounding neighborhood. There are also a growing number of urban experiments and urban farms that are just blocks away. 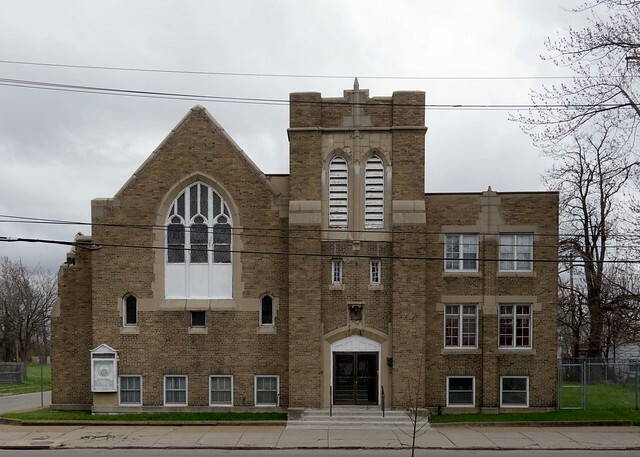 Buffalo ReUse is nearby and this church is located on Masten Avenue between two of the City's major school renovation projects - Performing Arts and City Honors. Erie County's newest library is located around the corner and Artspace is just a few blocks away. Frank A. Spangenberg is best known for his commissions on the City's West Side. He built North Park United Presbyterian in 1923 on Parkside Avenue. 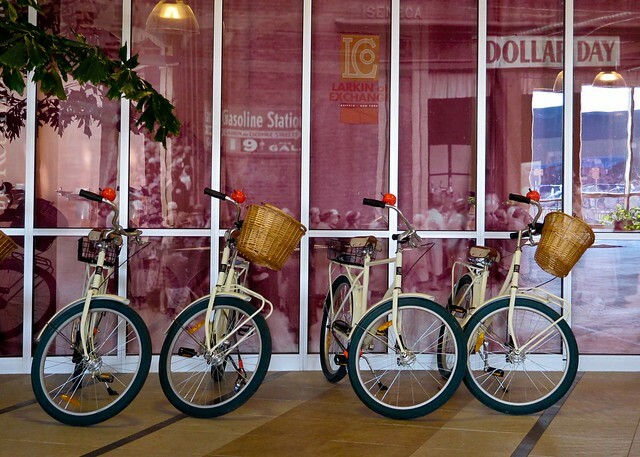 It was recently converted to a number of residential units and is now, the Lofts at Warwick. In 1925 Spangenberg built Parkside Lutheran on Wallace Avenue. Spangenberg also contributed to the 1922 Plan of Buffalo which was written by famed planners Edward Bennett and William Parsons. It was the first written comprehensive plan for the growth and physical development of Buffalo and environs. The plan is noted for locating a number of important new civic spaces for the then rapidly developing City. The location of City Hall and the Central Terminal were determined at this time. Spangenberg contributed this rendering of an alternative location for City Hall near the intersection of Main and High Streets. It would would have built on a 200' wide boulevard surrounding the downtown core known at the time as the Traffic Way. The $50,000 asking price might be just the right entry point for someone to consider a very creative secular reuse for this neighborhood landmark. Make sure to check out the listing for a peek inside the church. If you're interested in exploring this as a possibility, drop me an email. I can connect you with a number of people who've recently seen the interior space. 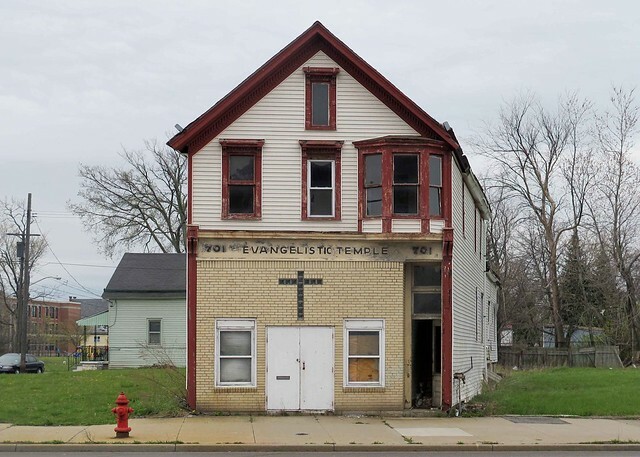 Last week the Campaign for Greater Buffalo held their Trico teach-in at the historic Promised Land Church in Buffalo's Fruitbelt neighborhood. Speakers included Ellicott District Council Member Darius Pridgen; "Trico baby" and small business expert Susan McCartney; architect and Chair of Buffalo's Preservation Board Paul McDonnell; attorney Richard Berger; local real estate expert and Preservation Board member Eric Lander and Tim Tielman. I've archived the full audio of the Campaign's Trico teach-in. Local developer Rocco Termini also spoke. 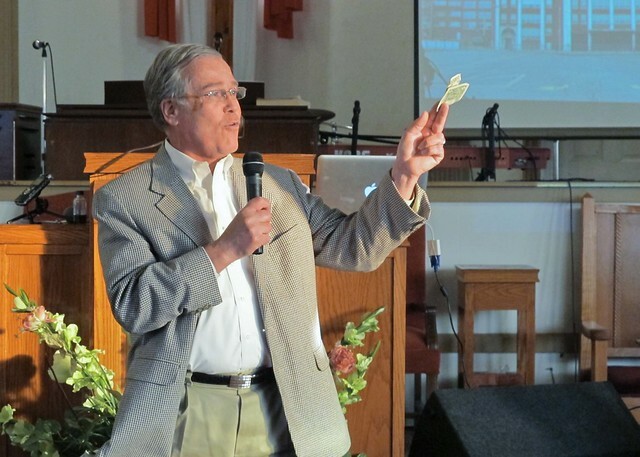 He reminded the audience that less than six months ago thousands of people arrived in Buffalo for the National Trust Conference to celebrate Buffalo's architecture and iconic buildings. 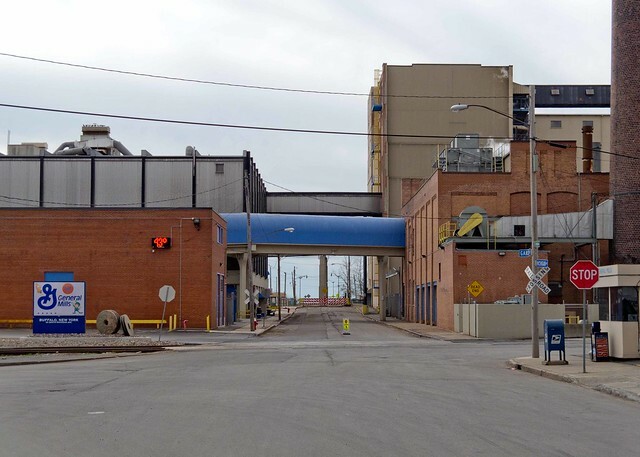 Now that one of Buffalo's most iconic industrial heritage buildings is threatened with demolition, Rocco Termini wants to buy Trico. You can hear Rocco take up the challenge to Matt Enstice's $1 offer that the Executive Director of the Buffalo Niagara Medical Campus made during Preservation Buffalo Niagara's Trico teach-in last week. Listen to Rocco (at the 30:50 mark). Not to be missed is Tim Tielman's storied account of the 50 year long assault on Buffalo's built environment. 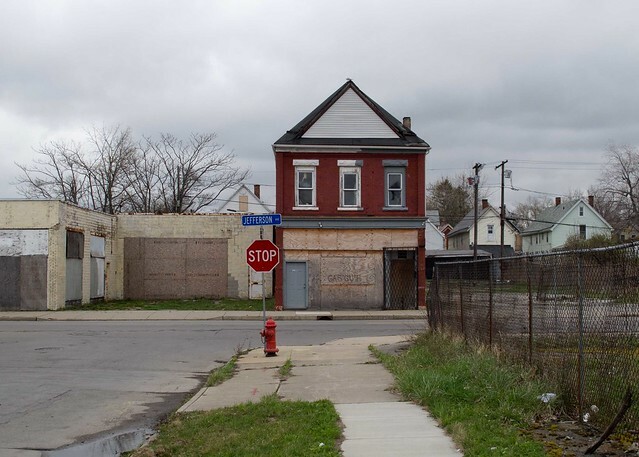 Here Tim argues that the proposed Trico demolition is part of long slow process involving the wholesale demolition of neighborhoods around Buffalo's downtown. In order to exist various federal, state and local agencies require a steady diet of buildings. The destruction of these compact, dense and walkable neighborhoods is revealed in Tim's account. 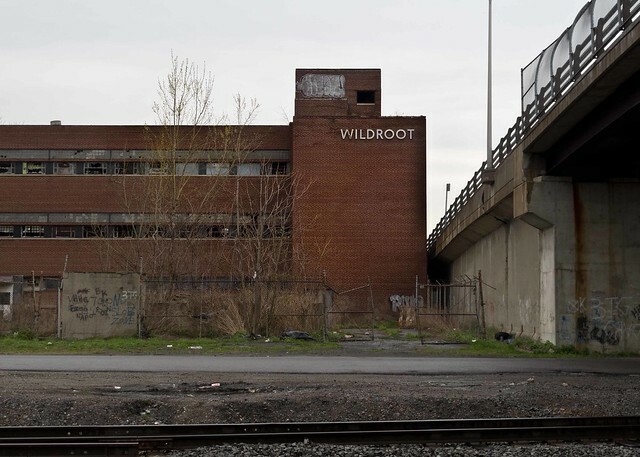 It's here in the heart of Buffalo's Ellicott District that urban renewal first raised its brutal head in 1957. Listen to Tim (at the 44:30 mark). See also: Wiping Away Trico - Part I, Part II, Part III, Part IV and Part V.